After the Green Goblin and the Sinister Twelve failed to defeat Spider-Man, Osborn plummeted into the waters of the Hudson River. Despite this setback, Norman still managed to evade authorities and, once again, returned to the shadows to plot against Peter Parker. During the Sins Past story arc, Norman continued to operate in a stealth manner, using his twin children (Sarah and Gabriel) to attack Parker. However, at some point Osborn was picked up by the authorities and placed into the custody of S.H.I.E.L.D. (this was an off-panel development first mentioned in the All-New Official Handbook of the Marvel Universe Update #1). With the initiation of the Superhuman Registration Act, the resulting C.S.A (Committee/Commission on Superhuman Affairs/Activies) was formed to apprehend the non-compliant super-humans. The C.S.A. decided to use super-villains to track unregistered super-heroes and garner public support for superhuman registration. Norman was selected as a candidate for this task. 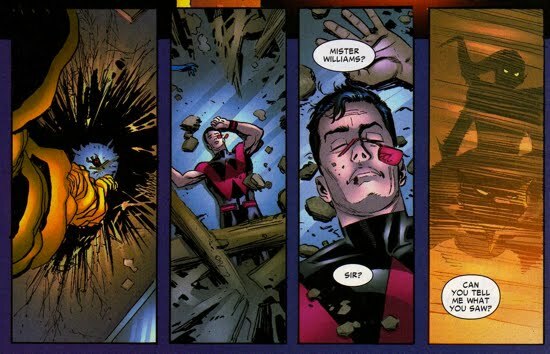 This event marked the beginning of Norman's second transformation into a legitimate citizen (the first being his return from death in the Dissociation From the Goblin section), a path that would carry him toward directing the Thunderbolts and eventually replacing both Tony Stark and S.H.I.E.L.D. The events that led to Norman being appointed the Director of the Thunderbolts are featured in Civil War Front Line #2-11. After revealing himself as Spider-Man to the world, Peter Parker was questioned about his relationship with the Green Goblin. Peter responded that Norman Osborn, the Green Goblin, had killed an innocent person that Peter cared for greatly. Peter went on to say that this person did not deserve to die and that was why Norman should be in jail for the rest of his life. An infuriated Osborn watched this on television and claimed Peter broke their pact, so he made a deal with S.H.I.E.L.D. to get back at Peter and to get out of jail. 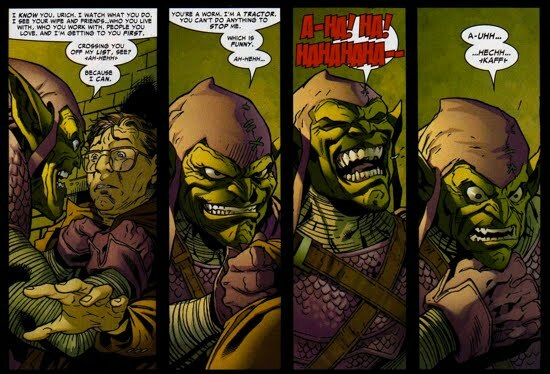 In Civil War Front Line #4-5, Osborn, now in his Goblin attire, attacked Ben Urich and threatened others as well. But before he could exact any revenge on Urich, who had outed him publicly as the Goblin, Norman went into a seizure and passed out on the ground. Norman was foaming at the mouth and was seemingly losing control of his body. This attack shook Urich, who was now convinced that Osborn somehow managed to get out of jail and back out on the streets. When Urich turned to his publisher, J. Jonah Jameson, his claims were dismissed and Jonah would not run with story. 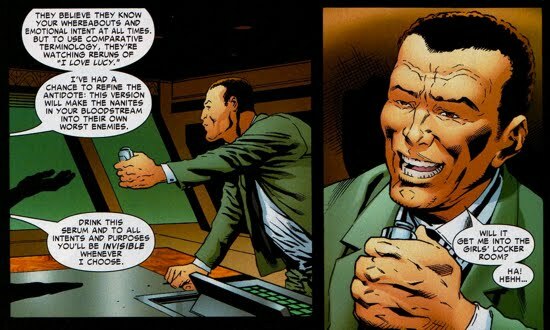 Urich was so adamant about it definitely being Osborn behind the mask that it led to Jameson firing Urich since the reporter would not give up on his belief. Jonah was not going to go public without concrete evidence to support it. Urich eventually rejoined the Bugle. 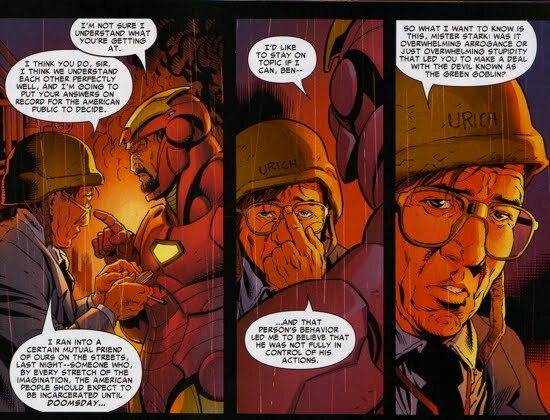 Urich questioned Tony Stark in Civil War Front Line #6 regarding his involvement with the Green Goblin, noting that the Goblin did not appear to be in complete control of his body during their encounter with him. This, of course, would later be traced back to Osborn having a procedure that placed a nanite restraint system inside his body. Back at Osborn Industries, Norman was paid a visit from a man that he was grateful to, but whom he also hated very much in Civil War Front Line #7. This mysterious figure gave Norman a serum that shut down the nanites in his bloodstream and allowed him to be “invisible” when necessary. The unknown person who made the deal with Norman was also responsible for getting him out of jail and set up with 'employment opportunities.' 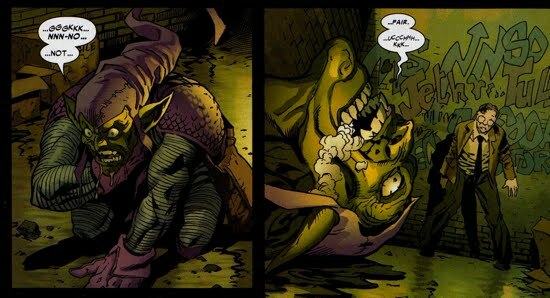 Soon after, the Green Goblin was put to work as he killed a small group of Atlanteans that were gathered in a warehouse. 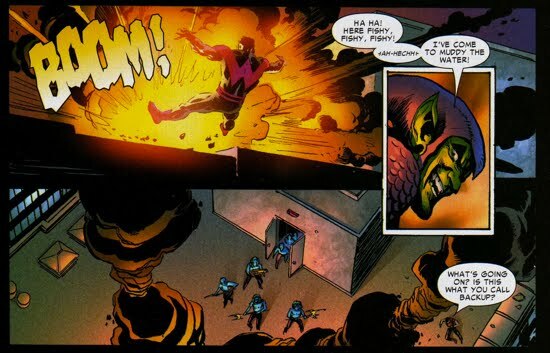 Wonder Man was there on surveillance and got caught up in the carnage created by the Goblin. He witnessed first-hand the Green Goblin's involvement in the destruction of the Atlanteans. When the detectives investigate the crime scene, they were baffled by Williams' claim that Goblin has returned because they believed Osborn was in jail. First of all, can only Osborn wear the Green Goblin costume!? Of course not, so just because there is a Green Goblin sighting does not mean its Norman behind the mask. 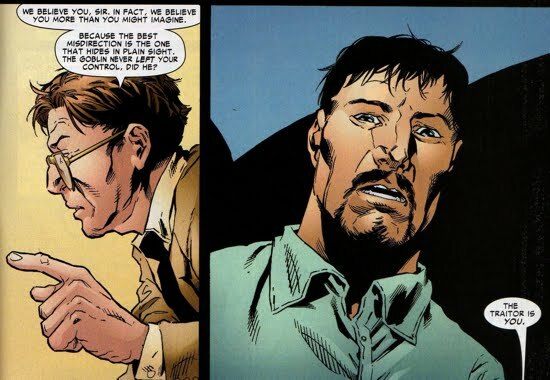 The only reason why Urich was so dead-set on that fact was because he looked into the villain's eyes and he has a long history with Osborn, so he would know for sure. Also, it's interesting to note that there seems to be a large number of people who knew Osborn was in jail, that is significant because of Osborn's upcoming rise to power. In Civil War Front Line #8, Detective Danny Granville informed Urich of a “warehouse fire” that resulted in the deaths of members of an Atlantean terrorist cell. 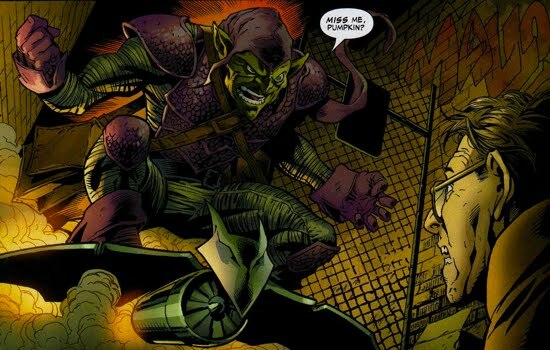 The explosives/chemicals that caused the fire at the warehouse were traced back to the Green Goblin, who had recently gone awol. The Detective suggested that someone from within Stark’s organization was responsible for these actions since they would be the only ones with access to Norman and the capability of shutting down the nanites in his bloodstream. Later, Norman, in his civies using a simple handgun, attempted to assassinate a member of an Atlantean delegation (named Ambassador Govan) on a diplomatic mission. The ambassador held the public forum to discuss the recent attacks on peaceful Atlanteans. Osborn was then subdued by police officers relatively efficiently, all the while he muttered to himself, "I didn't do it I swear." After his "botched" assassination attempt, Norman was placed into police custody and interrogated by Detectives Dixon and Alteri in Civil War Front Line #9. The two detectives were mainly interested in how Norman was able to breach security, possess a handgun, and avoid showing up on any surveillance tapes. 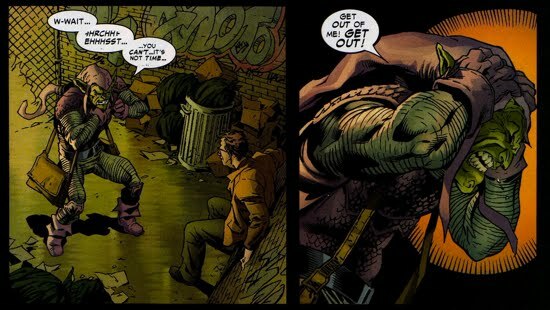 Not to mention Osborn's weapon of choice, a handgun, which seemed like a very odd selection for the supposed Green Goblin whose arsenal was as immense as Osborn was crazy. However, the most pressing question to the detectives was why he would do such a thing, Norman seemed to completely lack a motive. They were convinced Norman was aided by a powerful/connected person who tipped him off and allowed for the security. Norman's response to all of these questions was, "I can't say." At first it appeared as though Norman was being tight-lipped, but it soon became obvious that the nanites in his bloodstream were also blocking access to his own memory. Shortly after the detectives began their interrogation a shadowy individual ended it. The individual also claimed that Osborn was now under their jurisdiction and his case was a matter of national security, under the request of the President of the United States. Whether or not this person is the same shadowy figure who made the deal with Osborn in Civil War Front Line #7 is still unknown, but it very likely. At the conclusion of this story arc in Civil War Front Line #11, Ben Urich and Sally Floyd had pieced the truth together. They surmised that Osborn's transgressions were a staged series of events with the purpose of engineering a fake war with the Atlanteans to encourage more heroes to join the pro-registration side. 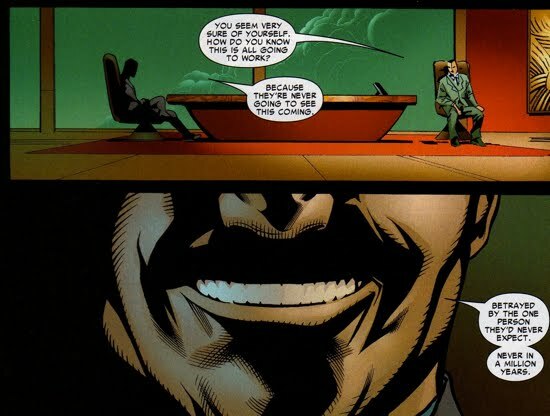 They accused Tony Stark of being the traitor within his own organization, and that it was he who manipulated Osborn as part of well conceived plan. Urich and Floyd are later informed that Norman had been released back into Tony Stark’s custody and that he was now in charge of the Thunderbolts program in Colorado. 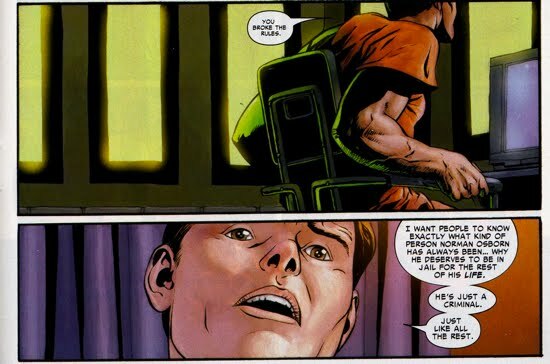 Norman depicted as a prisoner (center) in the Criminal Rehab Unit of the Commissionon Superhuman Activities facility, as seen in Iron Man (V3) #14.